Yet another better late than never report! 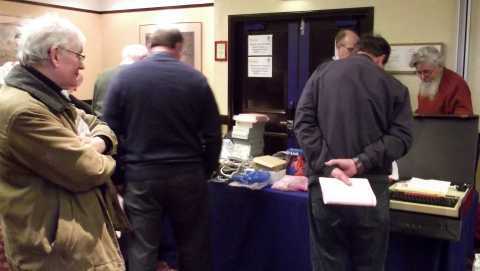 The last fortnight or so has been a busy one for me, and a major contributor to that has been the annual Wakefield Show, organised as usual by the Wakefield RISC OS Computer Club (WROCC), and held at the Cedar Court Hotel. The show took place on Saturday 28th April, 2012, and it made me busy in the week running up to it because I decided I’d have something new(ish) on show (more on that later), and in the week following it because I had to do the work I’d put off in order to work on that new(ish) something! 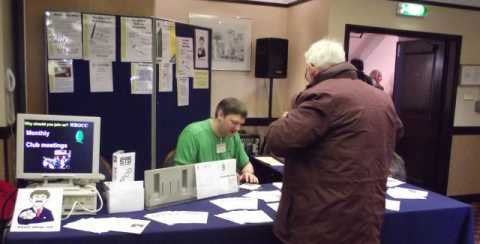 As for the show itself, I did have a fairly quiet morning on my stand, becoming busier later in the day. I initially tried taking advantage of that to wander around and speak to other exhibitors, but while my own stand was quiet, everyone else seemed busy and, of course, as the day progressed and I became busier, I had less opportunity to wander around myself. Oh, yes. The CD: The newsletters are all presented as PDF files, which means it should be possible to view them on pretty much any modern platform and, while I haven’t yet had a chance to look through them properly, it’s certainly interesting to see how the very first and very latest issues compare: As the ‘Welcome’ PDF explains, the first issue was nothing more than a sheet of A4 paper, produced on a BBC Model B and printed on a dot-matrix printer – reflected in the way it’s been recreated for inclusion on the CD – but in 2012 it’s become a full-colour A5 booklet, laid out on an IYONIX pc using Ovation Pro. 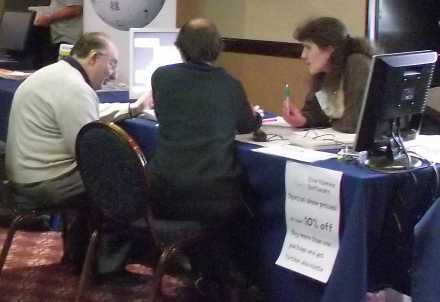 While at the WROCC stand, another punter (sorry, I’ve forgotten who you were!) was showing off a BBC emulator on his mobile phone: Something I had quite forgotten even exists – but while I’m thinking of it now, if you have a suitable Android device, take a look at BeebDroid from Little Fluffy Toys Ltd. I had installed this emulator before but, because my phone is somewhat lacking in memory, and the emulator couldn’t be transferred from main to flash memory, I ended up uninstalling it. Prompted by the discussion at Wakefield, I’ve now installed it on my Android tablet – but I’ve yet to actually play with it. Next along was the charity stand, with – as we’ve come to expect – a plethora of goodies on sale. Proceeds from the sale of all goods on the charity stand were destined for the Wakefield Hospice. Taking up one end of the hall, next came the NetSurf stand. Several core members of the NetSurf team were on hand to demonstrate the latest version (2.9), as well as discuss future plans and current issues – and, of course, sell CDs containing RISC OS build of the latest version for a mere fiver, which helps towards the cost of hosting, etc. Sadly, I got to the NetSurf stand quite late in the day, so I have yet to replicate my purchase of several years ago, when I managed to purchase the first ever CD they sold at that show – and more importantly, the first ever CD they sold at any show! Steve Fryatt was next to the NetSurf team – appropriately, since he is also a member of that team, being the person who works on the RISC OS front-end. Steve was demonstrating his home accounts software, CashBook, and his GhostScript front-end, PrintPDF, amongst other things. Next to Steve, Keith Dunlop of Usable Range was demonstrating the RISC OS multimedia experience on the newest and fastest native hardware – a Pandaboard, on which he was running R-Comp’s MusicMan software. We all know that we can’t have the moon on a stick, although we often seem to want it. What visitors could lay their hands on at the show, though, was Organizer on a Stick – a USB stick, to be precise. 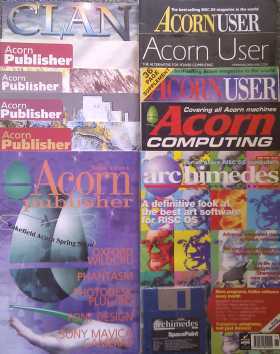 As the personal information manager for RISC OS computers, being able to carry Organizer around in your pocket so that you can use it wherever you are must surely make it even more useful, and that’s the idea behind this. The USB stick contains a copy of the emulator, RPCEmu, with Organizer 2 already installed; plug it into a spare USB socket on a computer wherever you are, and you can access the data in your copy of the software using the familiar RISC OS environment. Getting back to the subject of the show, on sale was the Archive Magazine volume 22 DVD (and double CD), which contains the complete contents of the first 22 volumes of the magazine, in various formats. (Despite being 25 years old this year, we are currently on volume 23, since the magazine is no longer published to a monthly schedule – though it remains every bit as enjoyable to read as it always has). The newly released version 1.40 of Luafox was being demonstrated on the next stand by its developer, Michael Gerbracht. Luafox is an application for analysis of scientific (or other) data, which can read that data in the form of OpenOffice/LibreOffice, Excel, CSV and Data files. Once loaded into the application, it can change and rearrange the data in numerous ways, apply various functions to it, and finally produce graphs and charts from it, which are saved in Drawfile format ready for importing into another application. New in version 1.40 is support for virtual memory, a recent file history, the ability to save a script from the reformat and header dialogue boxes, allowing you to apply that script to other tables, set operations, and improved user input handling. With a stand that appeared to be one of the main draws for the crowds at the show, R-Comp were next, and had a variety of new and updated items for the visitors to peruse, talk about and buy. The latest version of MusicMan 2 was available at the show. An application for playing back audio CDs and converting (aka ripping) their contents into digital formats, such as WAV, MP3, FLACC and OGG for storage on your hard drive, MusicMan 2 can play CDs digitally, which is a necessity for modern CD drives, and ripping the contents of CDs means they can be stored away safely, while the music (or other audio) can be played more conveniently, as part of your larger music collection, directly from your hard drive. R-Comp were also demonstrating an updated version of Genealogy Records, a program for storing and maintaining your genealogy research, and keeping a track of your family history. Focusing on the research aspect of the field, rather than the end result – the family tree – the software allows you to enter all your findings, documents, census facts and figures, etc, and link them together to help you form a picture of your family’s past, allowing you to filter, search and study your family records in a convenient manner. Backup software SafeStore 2 also received an update in the run up to the show, making it better able to cope with more of the many errors that can occur with different network backup drives, as well as including some enhancements to the user interface, and the ability to force a rebuild of the backup job. An update to DataPower 3, the flagship database for the platform, brings improved compatibility with the latest hardware capable of running RISC OS, better handling of links to external files, a number of new configuration options, and improvements to the application’s ability to send emails directly from within a database. NetFetch (and Hermes, the mail transport that is supplied as part of it) have been updated to deal with problems encountered on the Pandaboard, as well as the ‘quirks’ of various authenticated SMTP servers, which incorrectly report their capabilities. And, of course, R-Comp’s two headline acts this year were their new Android tablet, and the latest software update for the ARMini (and BeagleBoard-xM owners who have subscribed to their software support scheme), which allows the processor to run at a full 1GHz. 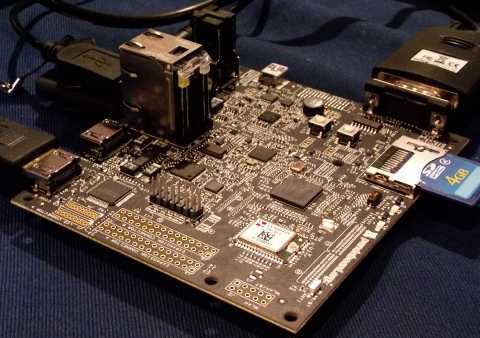 The speed boost for ARMini is the result of work done by Jeffrey Lee, who has written a SmartReflex driver for the BeagleBoard-xM. SmartReflex is the term used to describe a multi-level, multi-parameter power management technique found in some of the OMAP35x series, such as the Cortex A8 processor found on the card, and therefore inside the ARMini. For BeagleBoard-xM owners who are not subscribed to R-Comp’s scheme, the latest OMAP3 ROM builds on the RISC OS Open website include this driver, which is enabled by default. The speed increase makes what was already the fastest RISC OS computer available to buy even faster still – though not the fastest ARM hardware capable of running RISC OS; that accolade is currently held by the Pandaboard, which can be run at up to 1.5GHz, though it doesn’t (yet) provide an entirely stable experience when running RISC OS. The only time the R-Comp stand wasn’t busy was when Andrew Rawnsley was giving his theatre presentation, at which point the show hall itself became very quiet. I gather there was standing room only in the theatre, with the audience spilling over into the area outside. Richard Brown of Orpheus Internet was manning the next stand, talking to new and existing customers about what they can offer, in particular their new ‘Fibre to the Cabinet’ service, which is now becoming more widely available as BT have been upgrading their exchanges, and allows speeds of up to 40Mb down and 10Mb up. The Soft Rock Software stand was next, on which I was talking about WebChange, and demonstrating its ability to perform a case conversion as part of the search and replace process. Visitors were also invited to have a go at playing a desktop version of Quicksand or – the something new(ish) I mentioned earlier – a (very) early walk-around of a new adventure game. In practice, the underlying engine/development system (TrellisAI, formerly Trellis) needs to be completely rewritten from the ground up before that game can become anything more than an early walk-around, not to mention the many other things I need to concentrate on first, so it won’t be available for a very long time (and, as such, is unlikely to be a free download, unlike Quicksand). The key point of putting the walk-around together wasn’t so much to demo the new game, but to show off a change I’ve made to TrellisAI, to allow the graphic shown for each location to be oriented either as a landscape image across the top of the screen/window, as usual, or in portrait format, down the side. For those interested, however, it was originally intended to be a re-imagining of an older game, The Purple Crystal of the Heavens, which was one of the original Trellis demo games, but that plan has now changed. 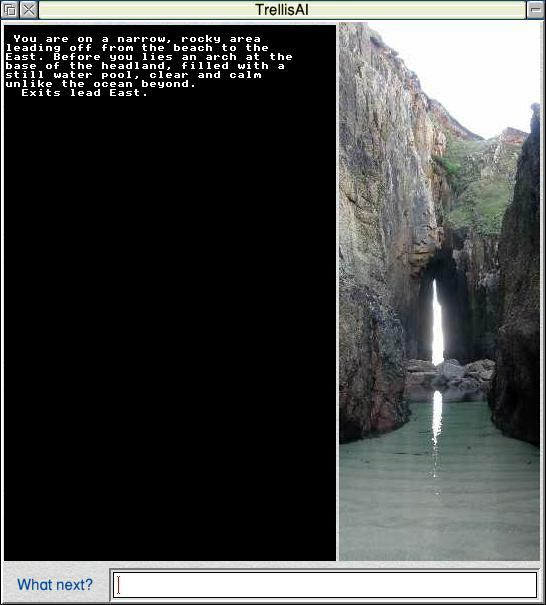 The game is currently untitled, and will take place on an island called Dog’s Head Island, and will feature a character called Worcester Smith. After my stand, Matthew and Hillary Phillips were on the Sine Nomine stand with their various applications, including database software, Impact, and their various desktop games, and giving out an A4 sheet of puzzles produced by SuperDoku and Wrangler (filling both sides) for people to take away and try. Relational database Impact has seen updates to its editing interface, and to its mail merge tool. Multi-line text fields can now sport scroll bars, which means the text contained in them can be longer than will fit in the visible part of the box. There is also now an option to allow text selection, so that portions of text fields can now be selected and moved or copied elsewhere, using the global clipboard and drag and drop protocol. The merge tool has been overhauled, to make it easier to design documents – but the biggest update is the inclusion of a new mail merge tool, ImpEmail. Impact already provides mail merge and formatted reporting via Ovation Pro and Impression, but ImpEmail provides Impact with the same flexibility for generating and sending emails. 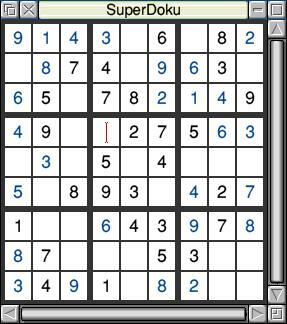 Of the games, both House of Cards and SuperDoku have had a few improvements since last year’s show – but it’s Wrangler that has seen a significant update for this year, with the addition of three new puzzle types, bringing the total up to seven. And providing me with yet another way to avoid actually doing any work myself. Thanks, guys! After WikiProject RISC OS was the RISC OS Open Ltd stand, on which they had a variety of things to keep the visitor interested, including native RISC OS boot USB sticks, emulation USB sticks, the latest version of the RISC OS developer tools, CMOS widgets for BeagleBoards and Pandaboards, and – of course – a BeagleBoard running the latest build of RISC OS. A Pandaboard was also to be found on the stand, and this show provided another chance to see the device that’s creating quite a stir – the Raspberry Pi. 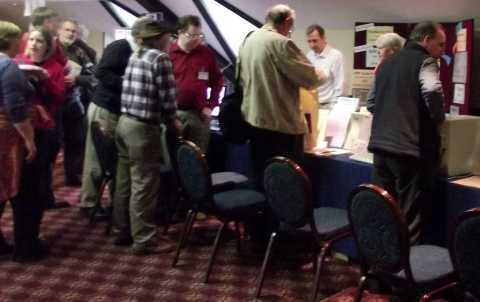 In an apparent change to scheduled programming, the Midlands User Group were represented on the next stand, where they would have been promoting their club and upcoming show – or is that shows? And next to them was the Retro Software stand, sporting a number of BBCs, an expanded Acorn Electron, and a couple of RiscPCs, playing a selection of classic games. 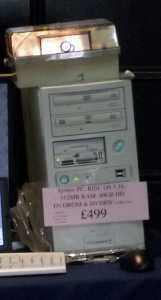 Next was the CJE and 4D stand, where anyone who is anyone could buy anything and everything – be it something small, like a mouse, or something a touch larger, like an IYONIX pc. Nothing new there, then. Oh, wait, except there was: A new version of Photodesk was launched at the show. Photodesk is the premier photo retouching and editing package for RISC OS, and is fully compatible with any computer running RISC OS 3.5 and higher, including the BeagleBoard. Version 3.12 of the application provides support for interactive help, previews of brush shapes, and new scaling options for the crop/extend tools. 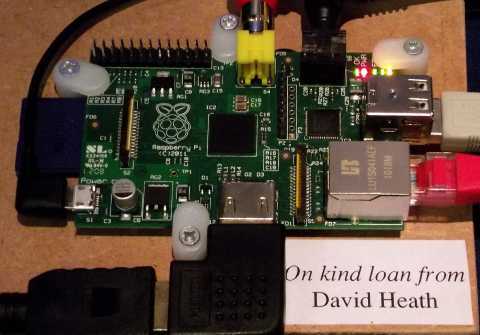 CJE also had a Raspberry Pi running on their stand, on loan to them from David Heath – although it wasn’t running RISC OS. And the last stand of the day played host to MW Software, where Martin Wuerthner was showing off version 2.X2 of ArtWorks, the platform’s most powerful and advanced vector graphics package, which was originally developed by Computer Concepts before they morphed into Xara. The main new feature in this version are “artistic lines” – lines with a variable thickness, offering much more variation and creative possibilities than the constant width lines normally found in vector graphics packages. Overall, although things were quiet for me at the start, the show was a very busy one with – it turns out – a higher attendance than last year (which itself was higher than the year before). What is it that’s bringing higher numbers to the show? New hardware last year, in the form of the ARMini? 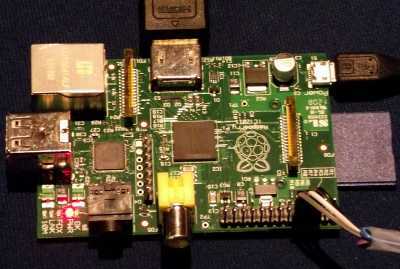 Potential new cheaper hardware this year, in the form of the Raspberry Pi? Who knows – let’s just hope it continues! “Jeffery Lee”? And is it “Photodesk” or “PhotoDesk”? Jeffrey’s name is now corrected – thanks. According to CJE’s press release, it’s Photodesk, so that one remains.